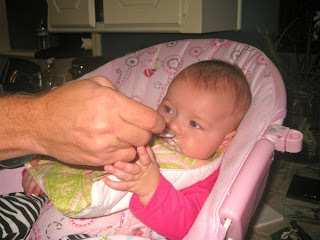 The Murphy Journeys: First Real Food - Well, Sort of! Not exactly what I should classify as real food, but it beats a bottle of soy ; ) After our four month doc visit, our pediatrician told us we could start her on some rice cereal whenever we were ready but she warned us that most babies really hate rice cereal and will cry bloody murder. 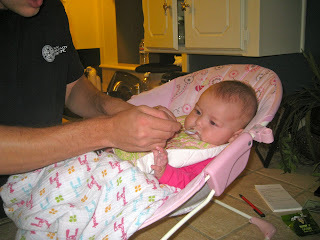 She told us to use Kate's formula to make it pretty runny and that the point initially is to just get her used to eating off of a spoon (as opposed to sucking on her bottle). 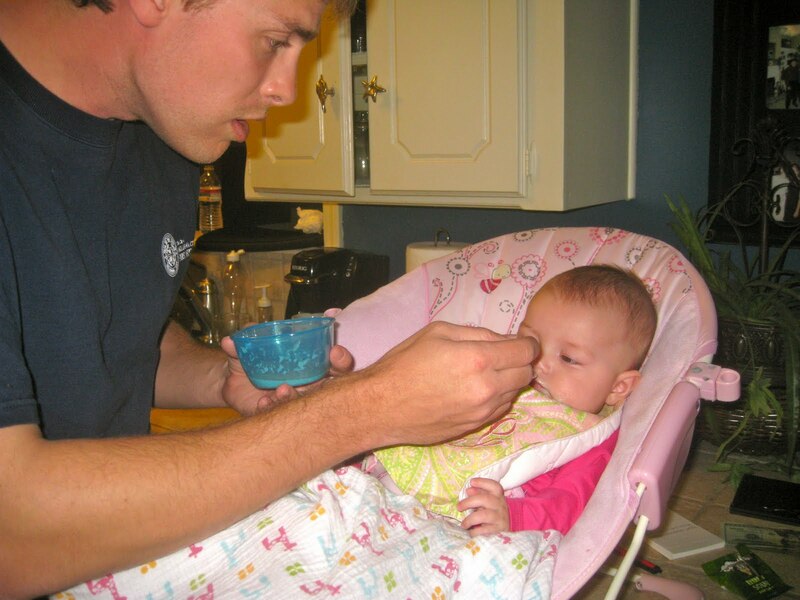 Kate has never, never, never turned down an opportunity to eat (or at least take a bottle) - ha!, so I felt pretty confident that she would love the upgrade to rice cereal and wouldn't throw any fits about it like the pediatrician forewarned. And, my instincts were right! 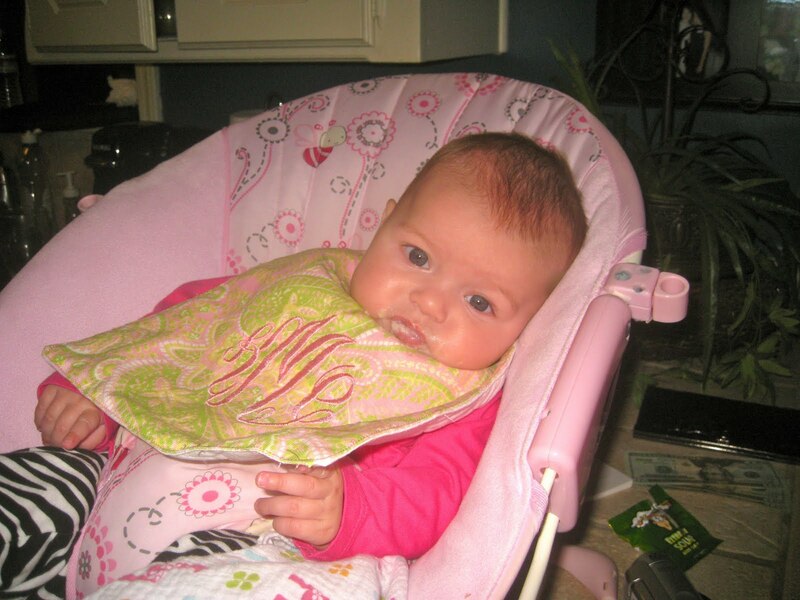 It was pretty fun watching her face as we fed her spoonful after spoonful ; ) She was a natural at eating off of a spoon and there was only one moment (you'll see the pic above) where she was tired of me probably snapping pictures and cried just a little. 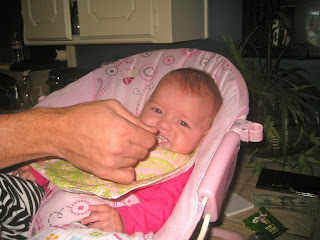 Otherwise, as we predicted, she loved every bite. Guess we'll continue to try to feed her a little rice cereal from this point forward. I have no idea what's next after this but I assume it'll be another upgrade to something even more yummy!! Kate sounds like my daughter....never met a food group she didn't like!! Cute pictures! Awbrey liked it too! Kate is getting too big! I need to see her again!